Pacific Pallets Pvt. Ltd is an ISO 9001:2008 certified company, known as the leading manufacturer & supplier of Wooden Pallets, Boxes and Crates. Based in Ahmedabad, Gujarat, we got incepted in the year 2011 with a high quality packaging solution. Our wide range caters to diverse requirements of cold storage house, warehouse and various industries such as chemical, pharmaceutical, FMCG and shipping. Over the years, we are operating successfully under the guidance of our directors Mr. Nikunj Mevada who have years of experience in this industry. We have our own sophisticated and advanced manufacturing unit with an excellent production capacity of 15000 pallets / boxes per month. With the support of our vast and well-connected distribution network, we have garnered a huge clientele across the world. For them, we present customized solutions in order to meet their specific packaging and transport requirements. In addition to this, we also offer reliable transport and logistic services. Our name is profound in manufacturing of Pinewood Pallets, Boxes, Crates, Skids & Pinewood Bins for Cold Storage in India. Our production facility is fully equipped with technologically advanced machines and tools that have great helping hand in our success. For production, we wisely import raw materials like pinewood from New Zealand and test it on standard quality parameters before use. Moreover, we believe in maintaining high standard of quality in entire production line and thus make dedicated efforts to avoid any scope of flaws in our products. Our products are designed to provide benefits of secure packaging & effective transportation of goods. Our company has gained a commendable position in this industry by manufacturing a quality oriented product line. Our entire strength lies in our proficiency and healthy relations with our clients across india. We have also maintained a high standard of quality in the production process so that finished products are durable and strong. Embarking on our experience in this field of wooden pallets, we are completely dedicated to continual improvisation through research and development. Prior to the sale of product, a thorough study of the application and its requirements is done as to ensure the success. Over the years, we have been continuously working for a high standard of quality in our production line. We have passed through a long and extensive journey to get success, name and fame in market. Through the journey, we have got many milestones as certificates and awards from some of the renowned governing bodies in the marketplace. We do 100% quality check of each order before dispatch in order to provide best quality to our customers. 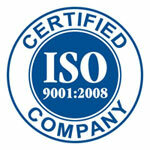 We are honored to have the ISO 9001: 2008 certification for our quality. This proves our credibility in the market. Our manpower works with an urge to deliver the best in industry. Today, the height of success at which our company is standing is due to all the efforts made by our proficient team. With full commitment, we have built an unmatched manpower in our company that works with a combination of strength with local focus for clients across country. Our team comprises of some of the highly experienced personnel who have deep knowledge about the quality of wood and it adaptability in a specific working condition. In addition to this, we also have a team of quality inspectors who keep a strict supervision on the entire manufacturing process to leave no room for any flaw in the products. Apart from this, they also check if all the international standards of quality are maintained. We also make arrangements for regular seminars and workshops so that the technical skills of our manpower can be upgraded per the latest market trends.